PPPA faculty conduct problem-driven research, teach in-person and online courses, and assist policymakers and government and non-government leaders at local through national levels. Faculty research encompasses two major areas, political science and philosophy, and includes fields from American security policy and political behavior to environmental policy, ethics, and the philosophy of language and science. Areas of expertise among political science faculty include American politics and public law, global politics, political psychology, public policy, political theory and American foreign policy. Philosophy faculty specialize in bioethics, ethical theory and applied ethics, metaphysics, epistemology, philosophy of language and science, and the philosophy of religion. The Thomas S. Foley Institute for Public Policy and Public Service is closely affiliated with PPPA, and the school actively supports the Joseph Kruzel Foreign and Defense Luncheon Series, the Frank Fraser Potter Memorial Lecture Series, and the Research and Methods Symposium. The political science B.A. is offered with three different options: pre-law, global, and general political science. The philosophy B.A. is offered with two different options: a general philosophy major or philosophy pre-law. 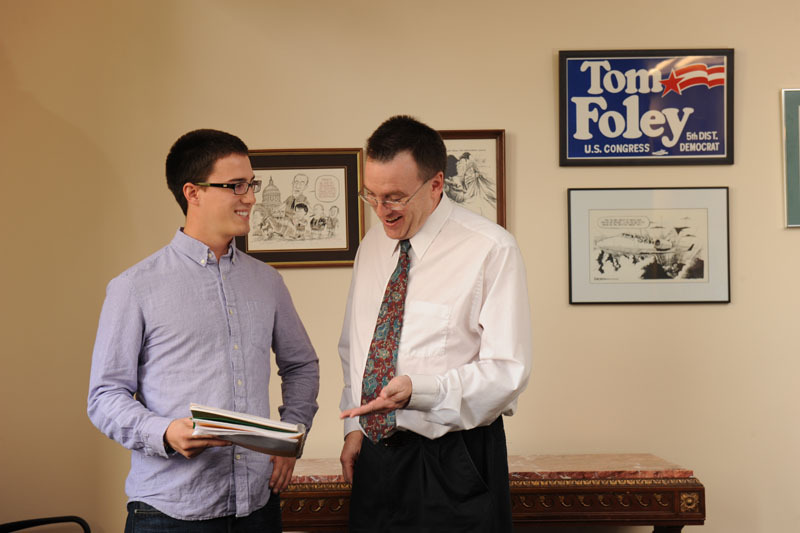 The Ph.D. in political science emphasizes a generalist and multi-methods training; students specialize in their dissertations on areas related to faculty members’ research interests. Full funding for Ph.D. students is available on a competitive basis. We currently have more than 506 undergraduate majors (312 political science undergraduate majors, 115 philosophy undergraduate majors, 79 public affairs undergraduate majors) and more than 80 graduate students. Twenty-one faculty members teach and conduct research in the major subfields of the political science discipline: American, comparative, international relations, public policy and administration, political theory, and political methodology, with sub-specializations in public law, American political behavior, political psychology, French and European politics, American foreign and national security policy, gender and politics, the presidency, the Congress, environmental policy, state and local politics, and qualitative methodology, to name a few. Philosophy faculty specializations include bioethics, ethical theory and applied ethics, metaphysics, epistemology, philosophy of language and science, and the philosophy of religion. The B.A. in political science was first awarded in 1930 and the M.A. in 1932 by the History and Political Science Department at the State College of Washington (renamed Washington State University in 1959). In 1956, the History Program separated into its own department, and in 1982 the Department of Criminal Justice was reorganized and housed within the Department of Political Science. For the next 28 years, the Criminal Justice Program was part of the political science department until it left to become a stand-alone department again in 2011. At this point, an opportunity arose to pursue a dynamic merger integrating the Departments of Philosophy and Political Science in Pullman into one school, along with the master’s program in Public Affairs in Vancouver. From this, the School of Politics, Philosophy, and Public Affairs was born, a program offering undergraduate majors in political science, philosophy, and public affairs; an M.A. in political science in global justice and security studies (which is also a graduate certificate program); a graduate certificate in bioethics; a master of public affairs and a Ph.D. in political science. The Pullman campus awards the M.A. and Ph.D. in political science. The Vancouver campus grants the master of public affairs, independently from Pullman.